There can be no denying that NYC is home to some of the most iconic architecture anywhere in the world. From the beautiful cathedral’s of St. Patrick and St. John the Devine, to the Freedom Tower, The New York Stock Exchange Building, The Flatiron Building, Grand Central Station, The New York City Post Office Building and on and on and on. 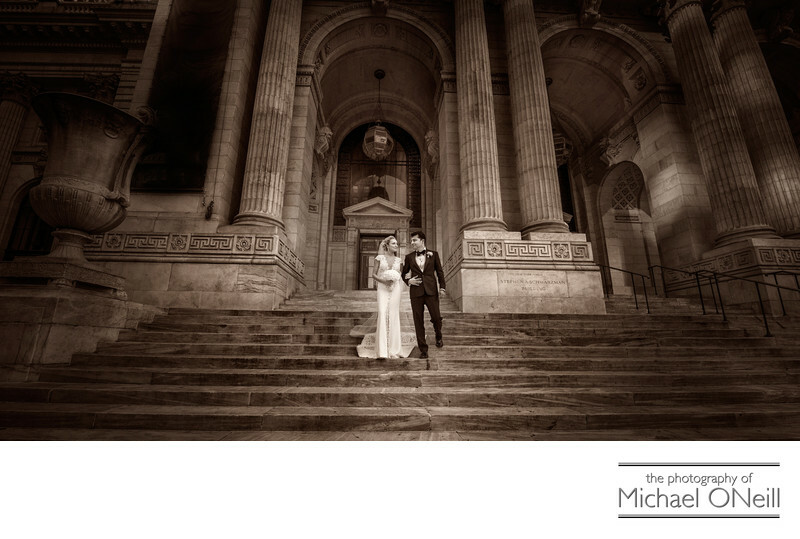 One of my favorite landmark buildings at which to create dynamic wedding pictures is the New York Library Building pictured here. As you peruse my web site you will find other pictures created at this wonderful example of architectural design. It’s towering columns adjacent to archways, dramatic stairways, massive sculptures and adjacent pools makes it an awesome location at which to create fabulous wedding photos. This candid photograph of the bride and groom descending the grand staircase was taken on a day that we had the opportunity to visit many other special NYC locations...some mentioned above, as well as some more organic environmental spots within Central Park. When planning your NYC wedding be sure to collaborate with a seasoned veteran photographer who know the lay of the land. The logistics of working in The Big Apple are tricky and require special considerations to facilitate transportation and parking. If you’re planning a New York City Wedding photography session give me a call.